Rebel was purchased by FALLEN OAK in early 2001. Rebel is the best 'all around' llama that we have ever seen. Rebel was only shown between 2003- 2009. We often hear comments about his wonderful attitude and great presence. 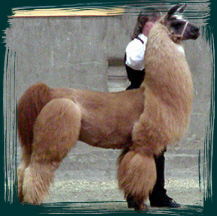 Rebel is willing to do whatever is asked of him & and he is a gentleman when around other llamas. He passes his personality on to his offspring. Rebel did well in the show ring, including winning overall Supreme Champion Male at the 2004 Solano Fair. He does well in obstacles and is only limited by his owner's mistakes. Rebel now has eight offspring. He has passed on his calm-friendly demeanor, thick fiber, great presence and cinnamon coloring (mostly). Rebel has produced Champions- most recently was Zuni's Grand and Reserve at the 2009 Grass Valley Show, Reserve at 2009 State Fair & Grand at the 2010 State Fair and double Reserve Grand at 2011 Hobo. Zuni continues to win Champions.